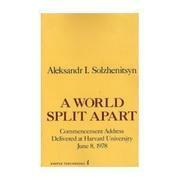 This, the text of the 1978 Harvard commencement address, falls under the heading of what Gunter Grass recently called "one of those strange antifreedom speeches" Solzhenitsyn has been giving since he came to live in the United States--but it is not merely a jeremiad denouncing Western materialism, moral laxity, loss of nerve: "the calamity of an autonomous, irreligious humanistic consciousness." For, however unreasonable Solzhenltsyn may be--however extreme, dogmatic, retardataire--he serves as a goad by his very ardor; and his vision of courage under stress--the basis of his claim for Eastern Europe's spiritual superiority--is attested to no less by the example (among others) of Sakharov, who otherwise disagrees with Solzhenitsyn in virtually every respect. Westerners meanwhile can rejoice that our degenerate, debilitated society at least gives Solzhenitsyn a free hearing.